Discussion in 'Apple, Inc and Tech Industry' started by AppleTech22, Apr 30, 2015. So I am writing my semester research paper on the impact the iPhone had on the smartphone industry, and would love some input from you guys on stuff that I should include. Here's my thesis: The iPhone completely revolutionized the smartphone concept, thus setting a new industry standard that is responsible for mobile technology as it is know today. I am having some trouble on the organization of thoughts and how this paper should be structured, so that's where I could use some help. My professor believes the best structure would be.. I have typed up the intro, design and application portions and am currently at 3.5 pages, the paper must be 6 at least. Any thoughts on specific facts to include or advice in general about how the iPhone revolutionized/created the smartphone to what it is today? Sounds like an interesting paper to write. You should take a loot at articles such as this, which lists features of the iPhone that were supposed contribute to it's 'failure'. These features became (in most cases) the reason as to why the iPhone was so successful. Talk about the shift from business professionals to being commonplace, and the design and functions. Well really you are looking at features such as a full touch screen interface, WiFi, virtual keyboard, lack of expansive storage and also the lack of manual in the box. Notice Samsungs new devices have all of the same features? I may be wrong here but I think their latest 'Edge' device doesn't have the option of expandable memory either, although this is trivial you get my point. Apple provided a phone without a manual. This was back when Blackberry still had their full sized keyboards and complicated on-screen widgets. Blackberry didn't adapt and they suffered because of this. I can't recall any phones having a "manual" I owned BlackBerrys back prior to the iPhone. Blackberry's claim to fame was email, their internet capability, i.e., web browsing was poor at best. Apple introduced a phone that was all display no physical keyboard that could run apps, later they introduced the app store. BB had nothing like that, it was less about being complicated imo and more about BB's focus (email and business) and the iPhone's target audience (consumers). A semester research paper only needing to be 6 pages long? Interesting. Just curious, is this for a college course? Not a bad thesis, but if you are going to delve into how the iPhone set a new industry standard, you will definitely want to start your paper by illustrating what the standard was before the iPhone. 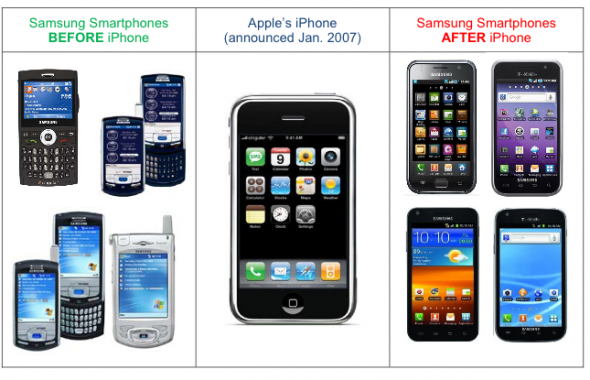 Clearly illustrate what a "smartphone" was up through the early-to-mid 2000's including what sorts of designs many of them had and what consumers typically used their smartphones for. Kind of like how SJ did during the keynote for the first iPhone back in 2007. I would honestly put a section like that first, because if you're going to talk about all these things the iPhone did differently and how the industry responded, you're first going to want to illustrate what the industry was like at the time. Other than that, your prof's suggested outline, although broad in scope, makes sense. What sorts of research do you have? I would be curious if there are any peer reviewed articles out there based on studies that have been done. If you have access to an online library, I would suggest trying a search, just to see what might be "out there". Include that people line up hours and days at the time of launch to buy them. Apple has a cult like following by many people, etc. Talk about the days just prior. Phone makers like Nokia and Sony Ericsson were making 'smartish' phones, but had gotten stuck with the same basic OS for years with minor tweaks to software and more focused on hardware, because they were primarily hardware makers. Apple, a software AND hardware company, came in with a total different approach, much more software focused. Before owning an iPhone I used mainly Nokia smartphones including the N95, the N85 and the N97 Mini. I have also owned a HTC ELF0100 (my first touchscreen phone) and a company-supplied Blackberry 8900. I obviously owned 'dumb' phones before these. All of which were provided with a hefty manual, some with two, one being a 'Quick start guide' similar to Apple's. Blackberrys emailing capabilities were the best I had come across however the majority of mentioned phones were capable of emailing. I'm unsure as to why you have never received a manual with your phones. My Blackberry was poor at web browsing when compared to the Nokia smartphones and the qwerty keyboard the Blackberry had was also not as good as the keyboard my N97 used. My BlackBerry did in fact feature apps and an app store called 'BlackBerry World'. You might not have known this because it was so fiddly to download and install apps, very much unlike the iPhone. Once I purchased my first iPhone, an iPhone 3GS, all of my previous handsets seemed very complicated. For example throughout it's lifetime I had used the handsets on old software because a 'Software update' seemed far to ahead of me. The iPhone provides a notification and the update is downloaded and installed OTA with the tap of a button. Simplicity is key and you will find that the reason why RIM is crumbling is because they didn't adapt. They didn't embrace the idea of 'more is less'. An all touch smartphone was not a new design. Heck the very first smartphone ever back in 1994 was all touch. And others followed, with dozens if not hundreds of such models having been made by 2004. By 2006, capacitive screen all-touch concept and prototype phones were all the rage, with their consumer sales debut publicly predicted to occur in 2007. You might also want to mention how much help Google was in making the original a success. Imagine the first iPhone without Google Search, Maps, YouTube or cell tower location (since it had no GPS). Is that 2005 Pidion smartphone running... Windows 98? Good eye. You're close, in a way. It ran Windows CE. Which meant that, unlike Windows Mobile's Pocket IE, the Pidion had an IE 4.0 browser in it. That means it displayed the full web based internet at the time. Two years before the iPhone's Safari browser. Full IE on WinCE was awesome for the period. As an enterprise developer, I started using Windows CE devices back in 2000 to surf the web over cellular CDPD connections. Used to drive my wife crazy bidding on eBay auctions at the last second from a restaurant back then. Shades of things to come for everyone many years later! This is nonsense. Cherry picked data for a pro-Apple argument. There were MANY phones before the iPhone that looked like pocket black mirrors. The notion that the entire industry switched overnight and decided that touchscreens were the future because the iPhone was released is a complete falsity. Many touchscreen orientated phones came before the iPhone. Thats how I'd do it but only bringing in the bold to emphasize a point. If the professor gave you that structure then that must be the best structure to follow. In my papers, I usually like to do similarities and comparisons. Maybe in this paper, you can write about the comparison between the best phone before the iPhone (ex: Blackberry) came out and the iPhone. Because of the better qualities/ characteristics in the iPhone, it became the best cellular phone available in the market. That's why other companies like Samsung started to compete and make their phones similar and better. This may sound confusing, but hope it helped you a little. The influence the iPhone has had really can't be overstated, similar to how people STILL tend to forget how much influence Apple had in desktop publishing. 2007 fundamentally changed how we consume media. Regardless of the look of phones previous to 2007, it was the iPhone that made those options, features, and designs ubiquitous. All-touch wasn't an Apple idea, true, but arguments like "Oh, yawn, they had touchscreen phones back in 1994!" only serve to cement the reputation of influence the iPhone has had. It's freely admitting that for almost 15 years no one could make it work, and boom! here's the iPhone, and mere months later everyone's rushing out touch phones and sure enough the anti-Apple camp is snickering about how Android is so original. Even a core developer for Android was quoted as saying once the iPhone was released they knew they had to basically go back to Square One. roadbloc may, as is typical, get all sour and try to backpedal the influence Apple has had - but look at things for yourself with an open mind. It's funny how some people, above all obvious facts, just plain refuse to give credit where it's due. Without the iPhone we would not have an iPad; ergo the tablet market would still be a written-off, has-been, tried-it-and-flopped segment (However, Microsoft would still be pushing clunky "convertible" laptops). The iPhone's popularity has also pushed standards-compliant video rather than Flash and Java. That's not to say Apple is a perfect company (stealing the GUI from Xerox Parc, hello?) - but for a track record of industry influence and paradigm shifts in communication, yes, it's remarkable. Ignoring the way things are is why they call it ignorance. Except if you see the facts and continue to ignore them it becomes arrogance. I never once denied that Apple influenced the industry. They have and in a huge way. Just not in the way rdowns picture displays, which is sheer nonsense. What's wrong with the picture? It refers to Samsung, not the whole industry. And its still complete rubbish. Samsung did phones that were basically just screens long before the iPhone was about. Samsung play with many form factors and continue to do so. I'm convinced you're anti apple and you're just trolling on these forums. Samsung's touchscreen phone was crap and non responsive before the iphone (https://www.youtube.com/watch?v=wMuC0vDNlQo). Why Apple was successful with the iPhone was mainly due to powerful and easy to use software and multitouch. I'm convinced you're anti apple and you're just trolling on these forums. Well you're wrong because I own plenty of Apple products I love. I'm typing this up on a Mac right now. I just deal in facts, not assumptions or overblown Apple hyperbole. Regardless of how it was actually received by consumers, it is a fact that Samsung did phones like it before Apple. As did quite a few companies. Companies such as LG were making some great smartphone progress in 06/07. One thing Apple did will on the iPhone, at least initially, was the software. The iPhone's form factor wasn't much of a step up, but the 'iPhone OS' (or OS X as they promoted it at the keynote) was the bit that made the iPhone stand out from other smartphones that were running software that was a bit more cumbersome. But in all honestly, the first gen iPhone wasn't even that successful. It took the 3G model and a price drop before consumer interest began to rise. it is a fact that Samsung did phones like it before Apple. The iPhone's touchscreen was by far the most accurate and responsive touchscreen on the market at that time, and multitouch blew everything out of the water, other manufactures didn't offer multitouch till years later. The iPhone was years a head of any other smart phones out there, to say Samsung and LG did phones like it before apple is just plain ignorant.